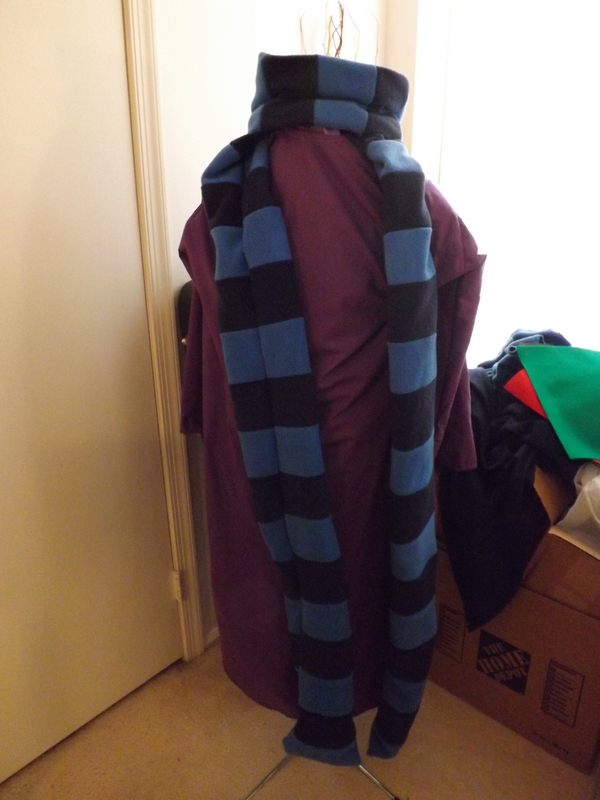 Part 2 in How to Make a Ravio Cosplay! Or at least, how I made one. One of the things that makes Ravio’s outfit a bit more complicated than it looks at first is how three-dimensional the details are. I’ve spent hours and hours doing applique on costumes, but Ravio has none of that: all of the details stick out from the base fabric. This is particularly evident on the hood, where the trim around the eyes sticks out a bit, but it is also true for the belt, which has three-dimensional red trim and a big 3D rupee in the front. For fabric, I used some brown faux leather I had leftover from my Merrill costume and picked up some red cotton (again from the quilting section of the fabric store; I use a lot of quilting cotton because it is much easier to match colors, and it has a flat texture like most fabric in games and anime have). 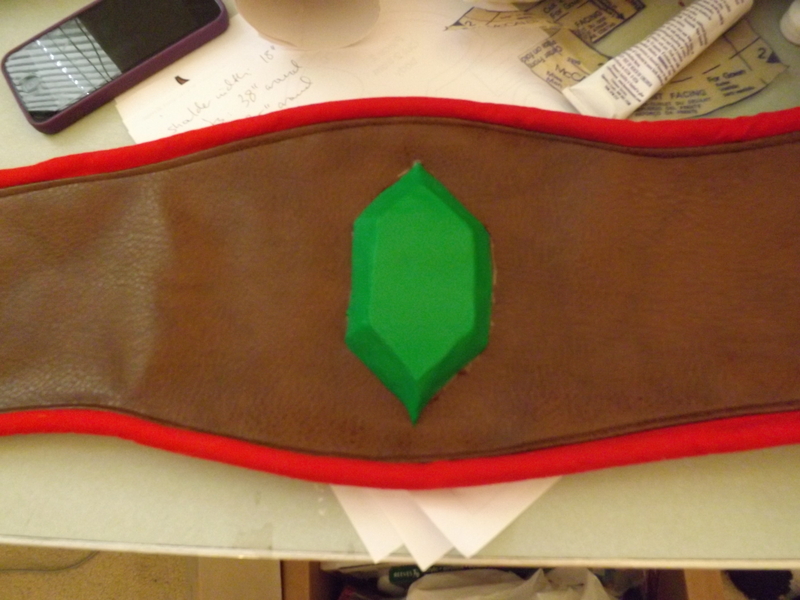 First, I made a pattern for the front of the belt, which is rounded and slightly wider than the rest of the belt. Then I cut the belt out of the faux leather, trimming the ends and adding velcro so that it fastens to the side. For the trim, I made red cording using thick upholstery cording and strips of the red cotton fabric. I sewed it to the belt then turned and topstitched the edges to keep everything looking nice. The rupee was the trickiest part of the belt. I knew that clay would be too heavy to attach to the belt, and even if it did hold, it would make the belt sag. So instead, I cast the rupee out of resin, which turned out quite a bit lighter. After doing some experiments with resin pieces, a scrap of faux leather, and a bunch of different glues, I attached the rupee to the belt using jewelry glue. We’ll see if it holds. Next week I’ll talk about the hood and Ravio’s companion Sheerow! Do you by change do any commissions? I am looking to purchase a Ravio scarf! I’m sorry, but I can’t take commissions right now. Good luck in your search!